When someone is purchasing a business, it is essential for them that they make sure the business’s assets are not overburdened by liens. Even if a business acquisition is structured as an asset sale, the seller’s liens become the buyer’s problem once the purchase is complete. Because of this, we are going to cover why commercial buyers should do lien searches before buying a business. Before we get started on the importance of doing lien searches before purchasing a business, we figured it would be best to first define a lien. If you have followed our title search company blog, you may already have a good understanding of what a lien is. For those who do not, however, a lien is a legal right or interest that a creditor has in another person’s property. If someone is buying a business with assets that are obstructed by a lien, someone else, likely a creditor will also have interest in the property. If a creditor does show interest, then the lien will still be active — even after closing — which can be bad news for the business’s buyer. While buyers can validly protect themselves by negotiating protections in the purchase agreement, this is hard to do without the appropriate amount of due diligence, and when it comes to liens, that means the buyer searching public records. Buyers should be on the lookout for the following liens in public records. One of the most common types of lien is a UCC lien, which is a security interest used to secure the seller’s debt. These liens are commonly found in bank financing, trade credit for equipment, as well as many other situations. If a lean is impeding personal property, the creditor will likely record the debtor’s state of business or organization in the Secretary of State’s public records. Similar to a recording system for real estate in counties, this system’s purpose is to give potential buyers of business a chance to notice that the property they are interested in purchasing is hampered by a lien. A lienholder can perfect its security interest by filing a UCC-1, which is a financing statement. This simple form includes information, like legal names, debtor and creditor addresses, and collateral descriptions. These statements are effective for five years, with the option to be continued for an additional five years after that. People can search a state’s UCC records for liens by filing an information request form or by performing an online search. For example, property lien searches in New York can be done online at the New York Department of State. When performing a UCC lien search, it is important to search for the business seller’s exact legal name. In addition, a title search company will be able to perform UCC searches. These UCC search services are very affordable and can also be used to perform tax and judgment lien searches — which we will get to below — on the same seller, making it more practical for the buyer. If a UCC search reveals lien filings, the buyer can determine whether or not the liens are intact by searching for a termination statement. When debt secured by a lien and filed with a financial statement is paid off by a debtor, a termination statement must be filed by a creditor to record the release of the lien. Finding an active financing statement that has not yet been terminated will require working with the business’s seller to ensure that the security interest is released before the closing of the property. A judgment lien is formed in the event of someone losing a case in court and has a judgment entered against them. These liens can be attached to real estate that is located in the county area where the lien is recorded and/or the judgment is entered. Judgement liens can also be attached to personal property, cars, and property acquired by a debtor after a lien arises. With judgment liens, just like the other types of liens, requirements can vary from state to state. When a business is unable to pay their federal taxes on time and in full, the Internal Revenue Service (IRS) can place a lien on the business’s property. With a tax lien in place, a business’s assets and accounts receivable that are acquired in the future can be affected. When the IRS places a lien on a business’s property, they alert creditors that the government has the legal rights to a business’s property by filing a Federal Tax Lien. 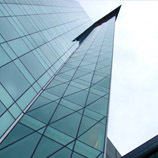 Residential Federal Tax Liens are filed at the place of residence of a taxpayer, however, with large corporations, this means that the liens are filed in the executive offices or where executive decisions are made. For small businesses, the liens are generally filed in the main place of business. Likewise, both state and local taxing authorities are able to place a lien on a business’s property if there are any unpaid state or local taxes. 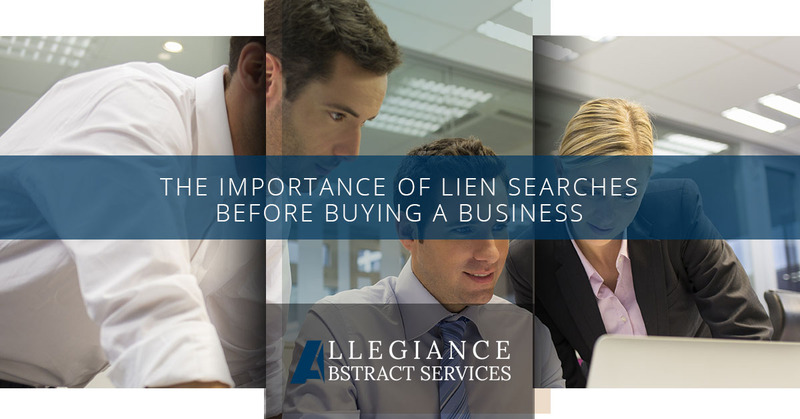 As you can tell from the information above, liens can present a buyer of a business with some serious risk. A smart buyer will do their due diligence by performing UCC, judgment, and tax lien searches. If you are purchasing a business, it is best to have a professional help you with your due diligence. Once a business deal is closed, there is nothing that can be down. However, with professional corporation search services, buyers can be confident that their deal has no hidden surprises attached to the property after purchase. And, if you are in need of a New York state corporation search, there is not a more reliable and trustworthy company to work with than Allegiance Abstract Services. 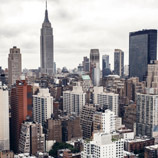 We are the go-to choice for title insurance services, including New York UCC searches, corporate searches, tax searches, and more! To learn more about our services, contact the friendly and helpful professionals at Allegiance Abstract Services!